FLIP: Place 1 A-Counter on 1 face-up monster on your opponent's side of the field. (If a monster with an A-Counter battles an "Alien" monster, it loses 300 ATK and DEF for each A-Counter during damage calculation only.) 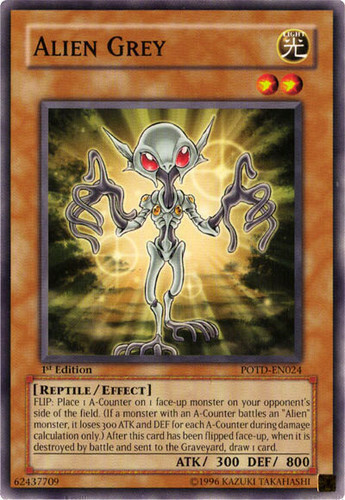 After this card has been flipped face-up, when it is destroyed by battle and sent to the Graveyard, draw 1 card.